Still pictures of the upcoming Mummy sequel, The Mummy: Tomb of the Dragon Emperor, have been released. You can see them in Horroryearbook.com. You can also find them in the official blog of the movie. They are pretty cool and they will definitely increase your curiosity for the movie. Looking at them, you will easily understand the main essence of the movie has remained intact. The previous two Mummys are action adventures and this new one also has lots of actions and lots of adventures. Both Brendan Fraser and Jet Li look awesome. 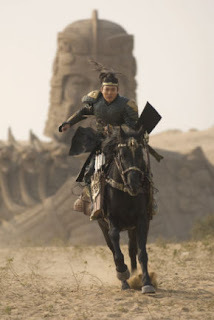 I love the picture where Jet Li, who is playing the resurrected Han emperor, is riding the horse wearing the black armor and battle gears. Brendan Fraser also changed his style especially, the weapons. In the first two movies, we see him slinging pistols and shotgun. This time he is using a machine gun but I think the shot gun goes better with his image. This time Alex (Luke Ford), the ten year old son of Rick O’Connell, is all grown up and stands beside his father and fights with the Han Emperor (Jet Li). Like the previous two, this time the adventure takes you to the remote Himalayas and ancient China.